Update: It's come to our attention that the image posted was fabricated, therefore the joke is firmly on us. Touche @luulubuu, you got us. 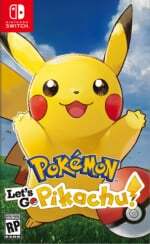 Original Story: Pokémon: Let's Go, Pikachu! and Let's Go, Eevee! have been available on Nintendo Switch for four whole months now, dividing the fanbase with more ferocity than the age-old starter Pokémon dilemma. We thought it was a solid, if not exactly outstanding entry in the series when we checked it out for review last year, but there was something we didn't pick up on at the time. And now we don't know how to feel about it. Twitter user, @luulubuu, has shared what could potentially be the most frustrating little easter egg to ever find its way into a video game. 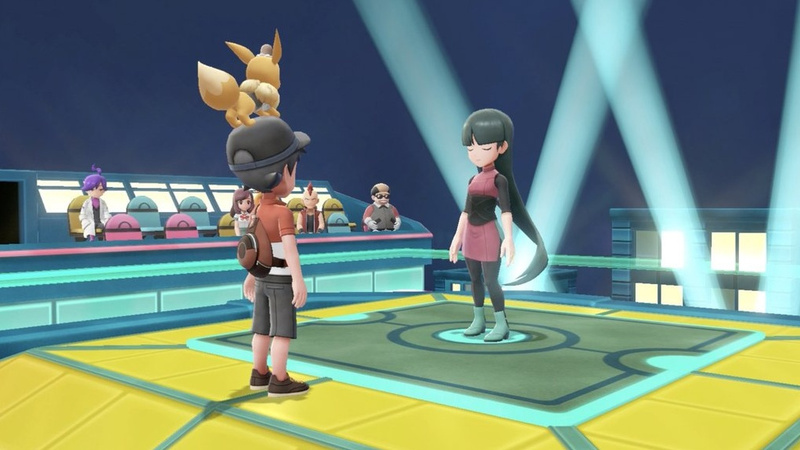 That's right, it looks like Game Freak might have put the 'loss' meme into our innocent little Pokémon adventure (note how Gym Leader Sabrina's strange love for the word 'loss' is combined with the way in which the lights are turned on in the building behind her). If you're unfamiliar with the meme, or if you're just not seeing it, 'loss' refers to a 2008 webcomic of the same name by Tim Buckley. For whatever reason, the internet did its thing and latched on to its layout, recreating the shapes made by the people in each scene via everyday objects, drawn lines, and whatever else they could think of. The point seemingly became to annoy viewers as soon as they realise they've been tricked into looking at yet another loss image. Here's a visual explanation. If you imagine the windows highlighted in the second picture split into four, and then look at how the lights are used to represent the positions of each character, it becomes pretty convincing. We're surprised that it's there, but we wouldn't be surprised if it was deliberate. Game Freak, how dare you? Where is the "Meme" from the windows ? People in the internet have weird hobbies. I'd say it's simply a coincidence. I can see the Loss in the 4x4 arrangement with each 2x2 panel, but I think this is far more likely to be a coincidence in how the windows were lit up. I seriously doubt Japanese staff are mocking the Ctrl+Alt+Del comic and its infamous "Loss" comic, let alone be aware of it. The internet really is stupid sometimes. Everyone here is 'loss' at the connection between the two. I get it but really, really don't think so. Definitely no. Stop reaching to connect everything to some of the sadder portions of a used to be funny webcomic. Nice try, Internet, but it's gonna be a no for me on this one. I wouldn’t say it’s a ‘strange’ love for the word ‘loss’, because she says the exact same quote in FireRed and LeafGreen. Sure, they could have put the visual reference in due to the line already containing the word (although I do think the whole thing is just a coincidence), but it’s not like the text is a new addition or anything. Wow, you must have very long arms with how far you're reaching! 1. No. It's not loss. 2. If it was loss, it doesn't need moral policing and outrage, faux or not. For the record: what's basically the most salvageable part of C.A.D. as of this writing are the Console Wars strips, depicting each console's fan as a cyborg soldier with a head resembling the console in question and the games as actual weaponry. Even then, that idea - ingeniously executed, I must admit - got its start with a joke at the Wii U's expense that could make both Brentalfloss and @Pachterkid blush, and got frustratingly radio-silent ever since the Switch proved each and every one of its naysayers wrong. What the heck are you reporting on, NintendoLife? @Preposterous : On slow news days like these, no straw is too thin. Finally there's something more farfetched than the reported reasoning for negative reactions to the comic itself. I'm freaking lost.. and still don't get it. Anyone care to explain in a bit more detail? I don't see the lines in the windows. Did this really deserve to have an entire article dedicated to it? The image doesn’t even look like Loss. Seems like a bit of a big reach, I also think a lot of people can find the loss meme in places they are not meant to be. Okay, what? No really, I don't understand this at all. I've never heard of this meme and don't remotely understand, but this seems like a real stretch, and from what other people are saying, it seems like you can force the meme to fit in places where it actually wasn't intended to be. Must be a slow news day to reach for this low to get some attention. 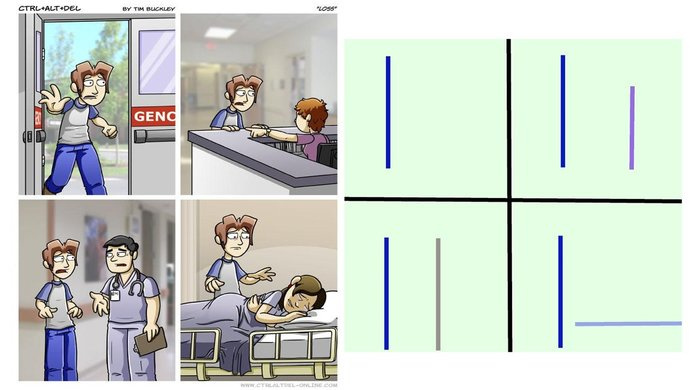 I've seen many different versions of Loss.jpg and I am pretty sure those windows aren't one of them. Even if this was a reference, it wouldn't be the first time a Nintendo game would reference a meme, so I don't see what the uproar is. This kind of reaching is hitting the same levels people would go to just to try to justify a new Smash Bros. character. This isn’t loss. At all. Anything, anywhere COULD be a coincidence. However, if this is a coincidence, it's one hell of a coincidence. Each window has 13 different possible lighting combinations, so the odds of getting those four combos in that order simply by chance are 1 / 13 to the fourth power, or 1 in 28,561. I honestly think it might actually be loss. I genuinely don't understand what I just read. I lost brain cells from this. This is a case where I think the internet has out-interneted™ itself. I am becoming more and more convinced that the majority population of the internet is merely a collective of the severely mentally unwell. This would have been worthy an article if we had confirmation from the developers. Can you imagine the confusion should someone ask the developers about this? I don’t get it, and I really don’t want to. I think it is a coincidence, but there's a chance that the localization team catched it and put that dialog accordingly. It reminds me of the infamous Doge reference in Tri Force Heroes, which was only available on the North American version of the game. Anyway, I'll play along it. Is this loss? I don't get it. I mean, what? @ryancraddock PLEASE do a quick youtube verification before you run clickbait articles like this, and you'll see the photo in that tweet was a photoshopped fake. There's NO loss meme reference AT ALL. Please maintain Nintendolife's basic professional journalism level. Twitter can lie all they want but it's YOUR job to filter and verify. I don't want to be more disappointed. I don’t get this meme. I’ve never seen it before. This is as much of a reach as trying to make LGP/E out to be anywhere near "outstanding" games. Wow. You guys are NO fun. Have a sense of humor, it won't hurt. Yeesh. To quote yet another old meme, IT'S A FAAAAKE! This was edited by that twitter user, it doesn't look exactly like that in-game. Might be worth doing some research before posting articles like this. Did I overdo it? A little bit? I could see this being a coincidence that the English translators took to their advantage. Do millennials actually think that "meme"(hospital) is humorous? If the answer is yes, I fear for all of us. I read the article and I'm still confused as fudge, the images you are sharing look nothing like the pose Sabrina is making. Not to mention said pose is something I've seen all the time with people feeling sad, how do you even come to the conclusion this is a reference to a meme? At least it's more subtle than the "over 9000" one. Still, could be a coincidence. "Game Freak, how dare you?" Nintendo Life, how dare you? @AlternateButtons it's not about a sense of humor, it just makes 0 sense to me. Guess I'm getting old. If you can explain what is remotely funny I welcome that. LOL! This disappeared quickly from the fronted news page. I am old, I don't understand it one bit.